New York Times best-selling author Carl Weber and award-winning novelist Eric Pete team up to deliver the first in a much-anticipated new trilogy. The Family Business features two times the heat, two times the fun, and two times the drama as the members of an unforgettable family (not to mention lovers and hangers-on) find their way in and out of trouble. As their many fans will attest, Weber and Pete share a talent for penning juicy fiction that their audience can&apos;t get enough of. This was an awesome read! I enjoyed every second. 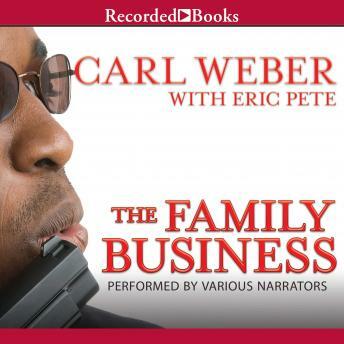 To all my Carl Weber fans he did his thing with this one. Loved it. Typical Urban Fiction storyline. Horrible book and narrators. I hated that i wasted a credit for this book. A wonderful book that kept me at the edge of my seat. Great job by the all narrators. I absolutely love this book! The storyline , the characters, and the narrator kept my attention throughout the entire story. I really enjoyed this book. The narration was also great. It made me feel like I was actually there. My first Carl Weber book. Loved it! Kept my interest the entire book. THIS BOOK WAS SO SO GOOD! IT KEEP ME IN SUSPENSE. WELL WRITTEN!